These superb sliding patio doors offer maximum glass areas, increased natural light and give you unobstructed views of the world outside. They are capable of large widths and heights, and despite their weight, they slide easily with minimum effort. Made from strong thermally broken aluminium profiles, they deliver thermal efficiency and high weather performance, making them suitable for use in areas that are highly exposed to the elements. With 'Penthouse' patio doors all panels can slide, a triple track system with three panels, can achieve approximately a two thirds clear opening. A specially designed threshold enables you to bring the internal floor level flush with the threshold, minimising any trip hazard. Suitable for both commercial and domestic applications, these doors will fill your property with light & make the most of a beautiful view. 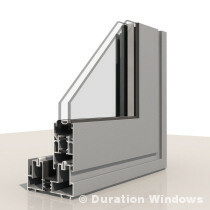 Slim and strong polyamide thermally broken aluminium profiles. Two to six panel configurations available - all panels can slide. Panels slide on a double or triple track. A triple track system with 3 panels, gives around a two-thirds clear opening. This system is designed to provide large glass panels, for unobstructed views and maximum light. Specially designed threshold may be flush fitted, level with the internal floor level, minimising any trip hazzard. Multipoint high security lock consists of 4 mushroom bolts and a hook lock, holding the doors securely in place. They are perfect for tall and wide doors, with panels upto 2.5 metres each, a 5 metre opening can therefore be achieved with just 2 sliding panels. A combination of stainless steel tracks and high specification hardware, will ensure that despite their weight your doors will literally glide open for years to come. High weather performance, makes these doors suitable for use in exposed areas. Delivery Testimonials Bifolds or Patios? Why Aluminium?